In continuation of our “Behind the Test” series, this month we look at the revolutionary new exam tool to provide task lighting and filter prescriptions. The LuxIQ from Jasper Ridge is the first of its kind exam tool that can quantify vision performance over a broad range of light levels, color temperatures and filters. Precision Vision sat down with Jasper Ridge’s President Michele Klein to discuss the development of this exciting new tool and how it can enhance your practice and improve the life of your patients. PV: Michele thanks for joining us on Behind the Test, can you tell us a little bit of background on the development of the LuxIQ™ diagnostic system? Michele Klein: Patients with vision loss – and their families – may feel sad, even desperate for solutions. Dedicated clinicians regret having to say, “the re is nothing more we can do for you”. Now there is one more thing to do—optimize task lighting. The LuxIQ makes it practical to measure and prescribe lighting. That is why we developed the LuxIQ Diagnostic System. Clinicians prefer an objective method to measure a patient’s needs before prescribing solutions. Before the LuxIQ, there was no standard quantitative, repeatable, practical method to recommend lighting for near-acuity. Now the LuxIQ gives eye care practitioners a science-based method for the office or home. PV: Michele, why has it traditionally been so hard to measure light that will improve functional vision? Michele Klein: Traditional methods of swapping bulbs, lamps, and filters, are slow, subjective, and have limited validation in clinical studies. Prescribing with the LuxIQ is fast, calibrated, repeatable, and backed by several independent clinical studies. The LuxIQ allows practitioners to measure and prescribe optimized lighting in less than 5 minutes. PV: Can you explain how the LuxIQ improves this process of quantifying vision performance through its measurement of ideal task lighting prescriptions? PV: an you tell us more about prescribing filters? Michele Klein: Clinicians may prescribe filters to reduce light or enhance perceived contrast. Like task lighting, filter selection is often based on subjective patient preference rather than a standard, repeatable measurement. Traditionally filter selection was dependent on variable lighting conditions, and required trial and error, sample lenses, and glasses. Now the LuxIQ simulates a broad range of indoor and outdoor filters, and speeds assessment. PV: Why is it so important to provide task lighting assessments and recommendations for the 60+ and K-12 age groups? Michele Klein: With lighting exams, student-aged children, especially those with vision disabilities, may be able to better keep up with studies and avoid falling behind early in their education. The LuxIQ helps clinicians and parents best meet a child’s needs. As we mature, we need more light to see. Most people over 60 need at least 3X more light for near acuity than when they were teenagers. For some, optimized lighting can make the difference between large and regular print books, or being able to read at all. 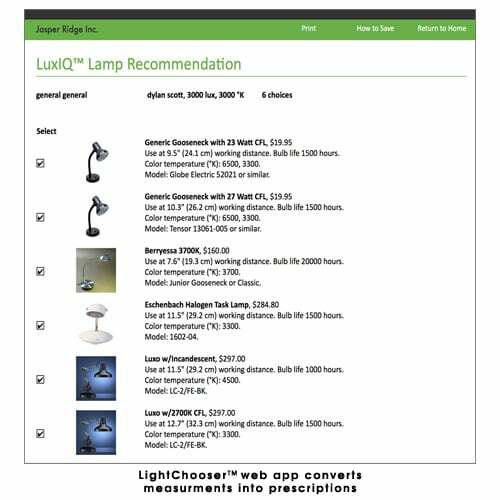 The LuxIQ combined with the LightChooser web app demystifies lamps, light bulbs, and filters, steering patients to exactly the right solution. PV: It sounds like this tool is a great way for a Clinician to add an important new service to their practice, it that a correct statement? Michele Klein: Yes. The LuxIQ is a clinic changer. 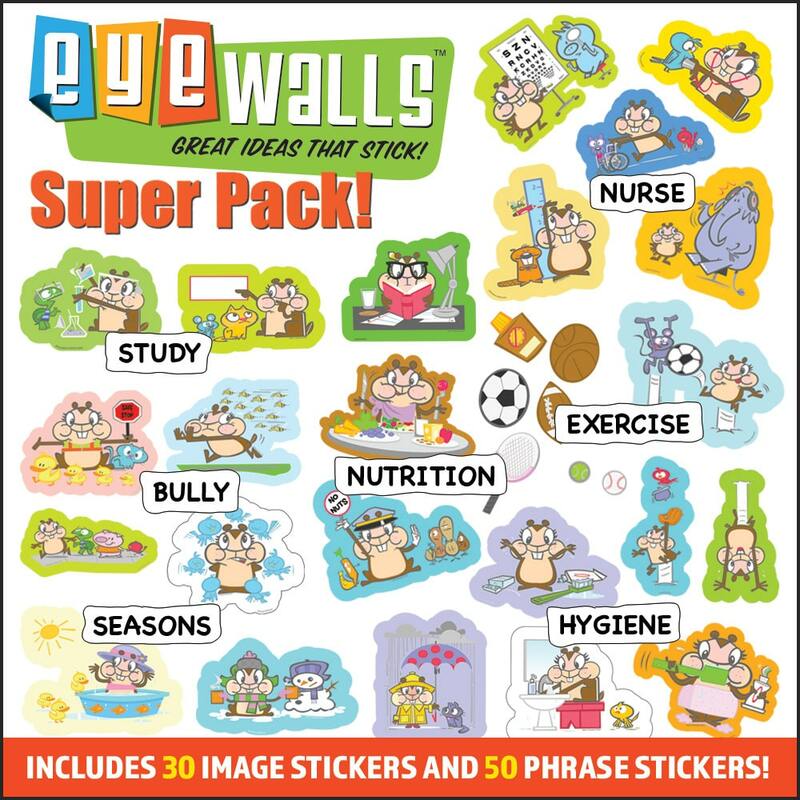 It helps ECPs differentiate their practice, providing a comprehensive solution for each patient’s visual acuity needs. The LuxIQ costs much less than typical exam equipment and pays for itself quickly. A number of clinicians have noticed an increase in their sales of task lighting, prescription filters, and sunglasses since adding the LuxIQ to their exam equipment. We’re particularly excited to see an increasing number of institutions in the US, Canada, and Europe placing volume orders so each vision specialist has their own. The LuxIQ is changing the clinical approach to lighting assessments. PV: Can the LuxIQ be used in clinical and research studies? PV: Why did you choose to partner with Precision Vision to distribute the system? 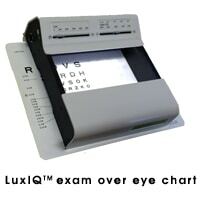 Michele Klein: Precision Vision Inc. is the world leader in eye charts, a key component of using the LuxIQ. PV has an outstanding reputation for quality, so the LuxIQ, the new gold standard for light assessment, fits right in its product line. PV supports the industry with their participation in professional forums and is our valued partner for serving the general optometry market. PV: Thank you Michele for all of your time. If someone has more questions regarding the LuxIQ can they contact you? 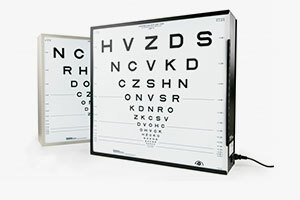 Q: Dear PV, I just purchased your ETDRS cabinet Mixed Contrast Distance Chart for my clinic. However, it did not come with any specific instructions for use. I assume it is to be used with the cabinet illuminated at 2.5 or 4 meters. I did not receive any Low Contrast test recording forms with it, so how should the results be documented? A: Thank you for your question. The left side of the chart is used like any other high-contrast letter chart. 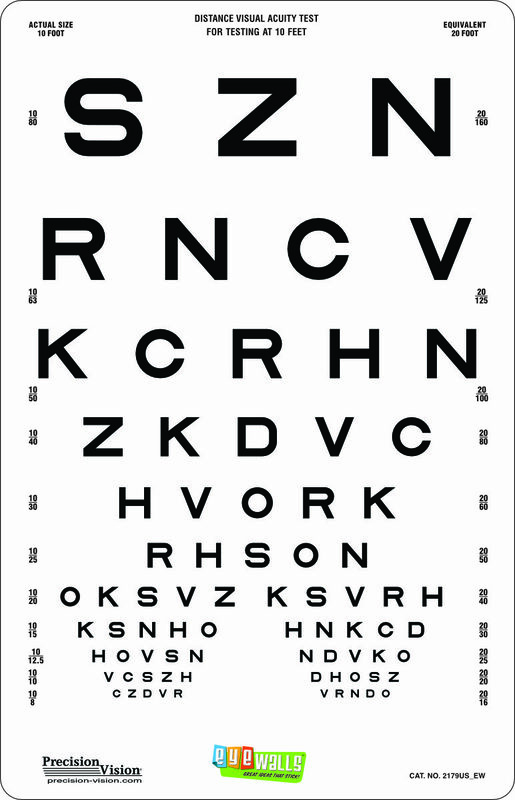 If the chart is used for Low Vision patients, I recommend a 1-meter viewing distance, since 1 meter (measured with a cord) is more accurate than longer distances that are just estimated. 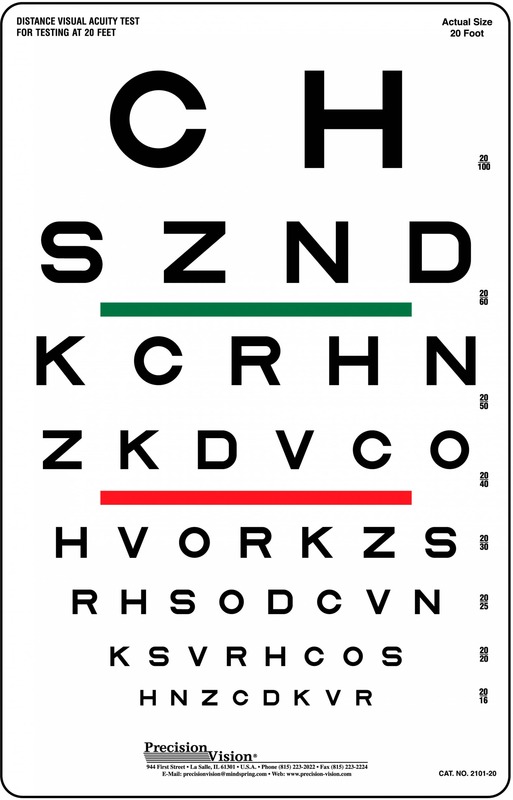 If the visual acuity is better the chart can also be used at 2.5 meters. 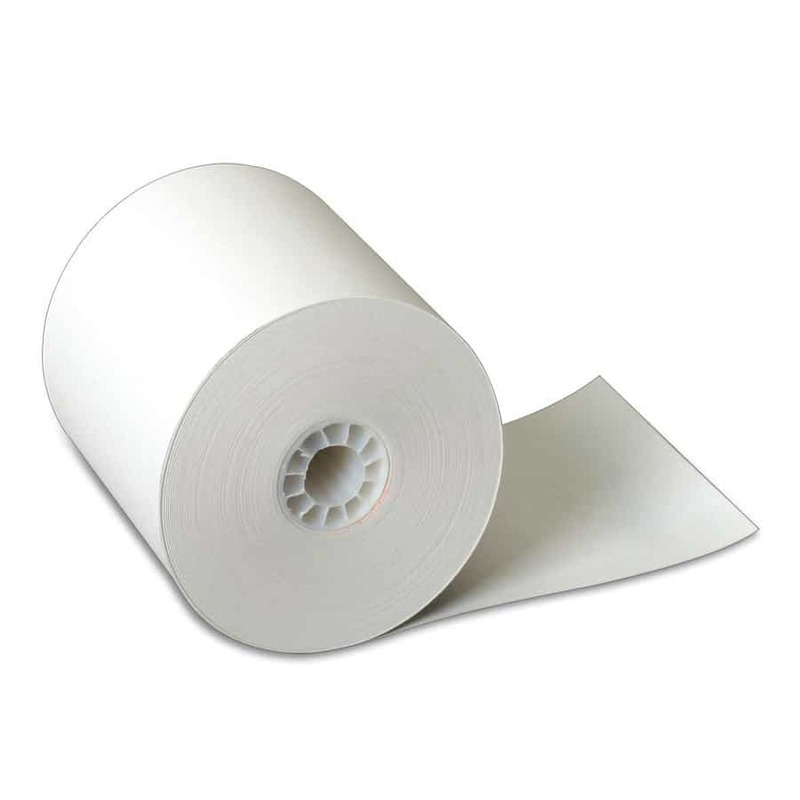 Scales for 1 meter and for 2.5 meter (100 inches) are printed on the left and right margins. The M-units are listed in the center of the chart. If the patient reads 1 or 2 lines less on the low-contrast side, this is considered to be within normal limits. Larger differences point to contrast problems. In some AMD patients we have found a difference of 10 lines! If the HC-LC difference is greater, you will have to explore what the reason is. The HC-LC difference measures the SLOPE of the CS curve. This is different from measuring the PEAK as is done with the Pelli-Robson or Mars cards. Recording your findings does not require any special form. It is done in the same way as you always record your findings in your record. You can just add (HC) or (LC) after the acuity value. e.g. 20/25 (HC), 20/32 (LC) represents a normal finding (one line difference). 20/25 (HC), 20/63 (LC) represents an abnormal finding (four lines difference). The advantage of the Mixed Contrast format is (1) that you do not need to switch charts and (2) that the difference is immediately obvious to the patient and to others. (1) Saves time in not having to switch charts, (2) saves time in explaining the results. We hope that this results in more clinicians paying attention to contrast problems.